Tuberculosis dactylitis is exceptional. We report 4 cases of osteoarticular tuberculous dactylitis in 3 women and 1 man. The diagnosis was suspected on chronic and insidious clinical presentation, and confirmed by histology. Patients were treated by anti-tubercular drugs with good functional and radiological outcome in all cases. Clinical and therapeutic issues are discussed by the authors in the context of an endemic country. Tuberculosis (TB) remains one of the most widespread infectious diseases in the world. The osteoarticular TB represents 5% of all TB. The tubercular involvement of the finger bones is an exceptional presentation of extra-pulmonary TB . The insidious presentation, the poor symptomatic character of the tubercular dactylitis may explain the constant delay in the diagnosis. It is often delayed and confused essentially with bone tumors which imply histological confirmation. This location responds effectively to anti-tuberculous drugs. The following study reports 4 cases of TB dactylitis through which various diagnostic problems and therapeutic implications are illustrated. A 64-year-old woman, diabetic and hypertensive, presented with pain and swelling of the fourth finger of the left hand that appeared after a benign trauma that occurred 21 days before. There was no history of fever, weight loss or loss of appetite. The clinical study found a swelling and inflammatory aspect of the skin of the finger. The finger motion was painful and limited. 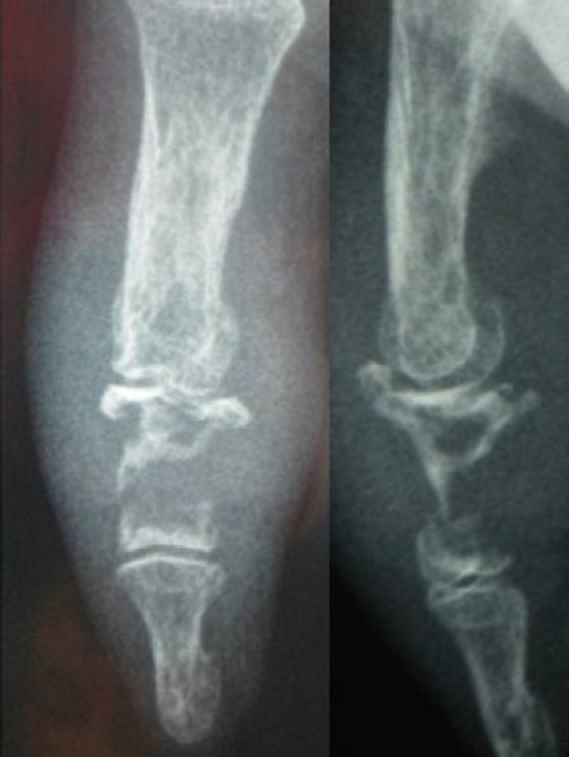 Left hand radiograph showed an osteolytic lesion with blurred limits of the first and the second phalanxes of the fourth finger ([Figure 1a]). There was a cortical lysis without a periosteal reaction ([Figure 1] b). Other lytic lesions were discovered at the level of the first and the second phalanxes of the fifth finger of the left hand. The interphalangeal joint did not present articular pinching. The analytical study showed elevated acute phase reactants (erythrocyte sedimentation rate: ESR = 60) and a total leukocyte count at 8500/mm 3. The intraoperative exploration of the fourth finger showed a friable bone with a grayish white necrosis material with soft consistency. Bacteriological study was negative. The histological study revealed granulomatous inflammation with caseous necrosis. The special coloring of Ziehl–Neelsen did not highlight the Mycobacterium tuberculosis (MTB). This typical histological aspect made it possible to carry the diagnosis of a tubercular dactylitis. The investigations did not show other tubercular sites. The intradermal tuberculin reaction test was negative. Chemotherapy associating four anti-tubercular drugs was prescribed (isoniazid, rifampicin, pyrazinamide and streptomycin) over 2 months followed by bi-therapy (isoniazid, rifampicin) over 10 months. This was associated with immobilization of the fourth finger by a splint for 21 days. There was a remarkable response to therapy with the disappearance of inflammatory signs. Radiograph after 14 months showed a significant reduction in the size of the lytic lesions with sclerosis around ([Figure 1c]). 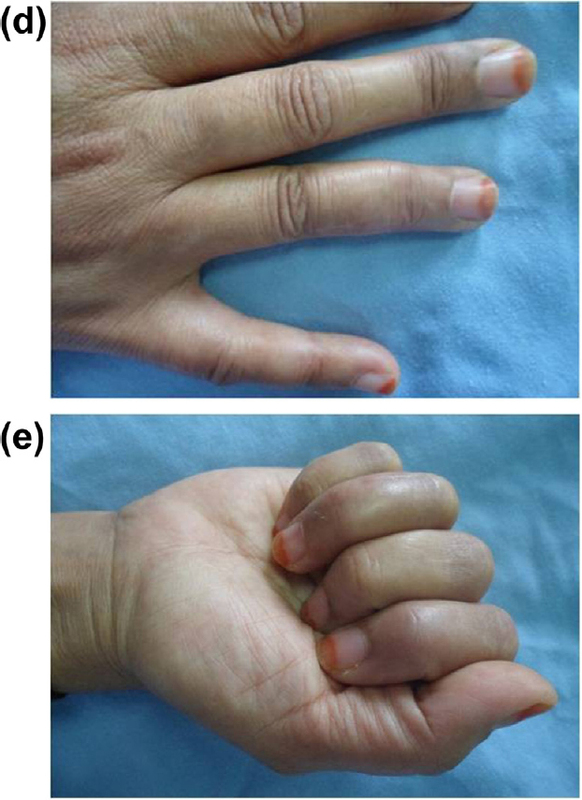 A 38-year-old woman, under corticotherapy, presented with a painful swelling of the fourth right finger for 2 months. The clinical study showed a painful swelled finger at the level of the proximal interphalangeal joint, without inflammatory signs or ulcerations. The mobility of the interphalangeal joint was painless. There was no history of fever. The right hand radiograph showed, at the level of the second phalanx of the fourth finger, multiple geodic, not-well-limited osteolytic lesions and a fracture of the phalanx without periosteal reaction. The interphalangeal joint did not present articular pinching ([Figure 2a]). The analytical study showed a normal rate of acute phase reactants (ESR = 25) and a total leukocyte count of 8600/mm 3. The intraoperative exploration showed friable bone with a geode that contained caseum. The bacteriological study was negative. The research of the MTB after culture on the Löwenstein–Jensen medium was negative. The histological study found a granulomatous inflammation with caseous necrosis confirming the diagnosis of tuberculous dactylitis. No other tubercular site was found. The intradermal tuberculin reaction test was positive. The patient received anti-tuberculous chemotherapy associating for 2 months: isoniazid, rifampicin, pyrazinamide and streptomycin, followed by bi-therapy (rifampicin, pyrazinamide) with a total duration of 16 months. An immobilization of the fourth finger by a splint for 21 days was initiated. The radiograph after 12 months showed a reduction in the size of the lytic lesions with osseous thickening ([Figure 2b]). 4 years later, an excellent osseous reconstruction was obtained with a good functional outcome ([Figure 2c],[Figure 2d],[Figure 2e]). 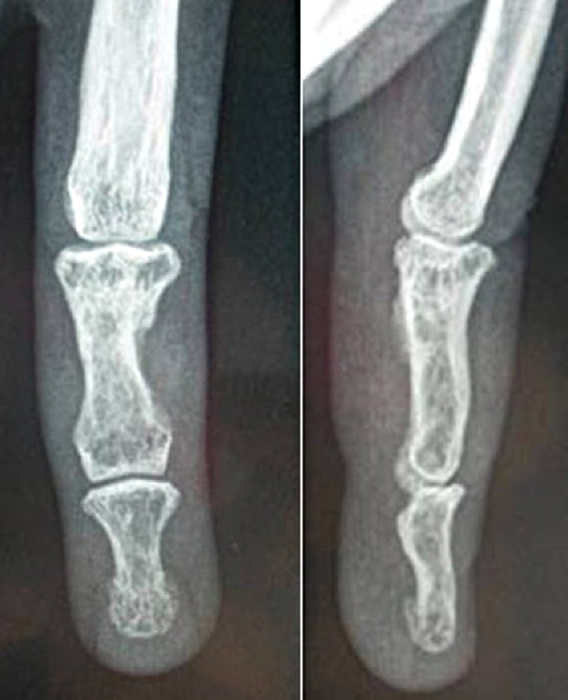 Figure 1a, b: X-ray showing osteolytic lesion of the first and second phalanxes of the fourth and fifth fingers, with cortical lysis and fracture of the second phalanx of the fourth finger without periosteal reaction. 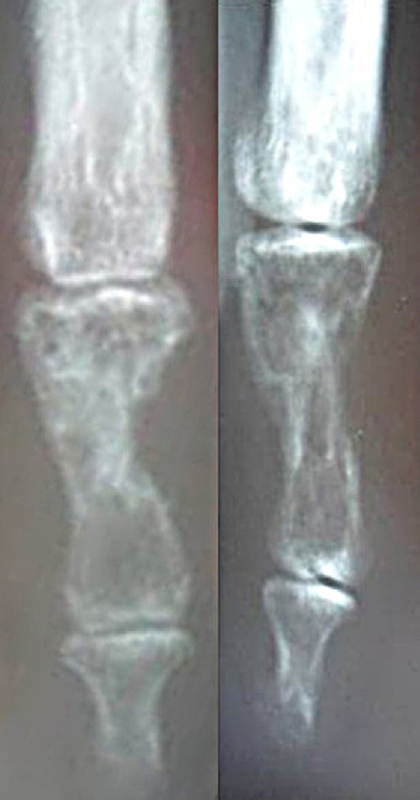 Figure 1c: X-ray showing osseous reconstruction after 14 months of anti-tubercular chemotherapy. Figure 2a: X-ray showing osteolytic lesions of the second phalanx of the fourth left finger. Figure 2b: X-ray showing a reduction in the size of the lytic lesions with an osseous thickening after 1 year of antitubercular chemotherapy. Figure 2c: X-ray showing excellent radiological outcome with osseous reconstruction after 4 years. Figure 2d, e: Good functional outcome after 4 years. 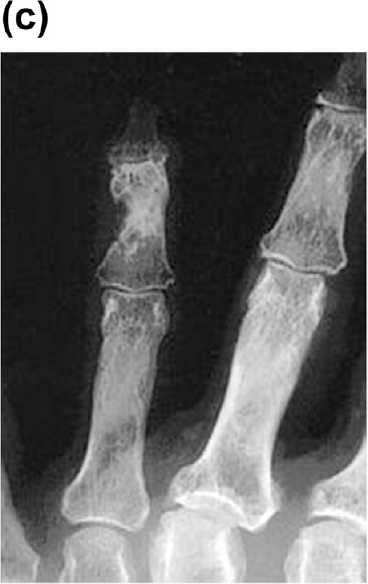 Figure 3: X-ray showing osteolytic lesions in the second phalanx of the fifth finger with cortical lysis. A 43-year-old man presented with a painful tumefaction of the right thumb that evolved over 6 months. 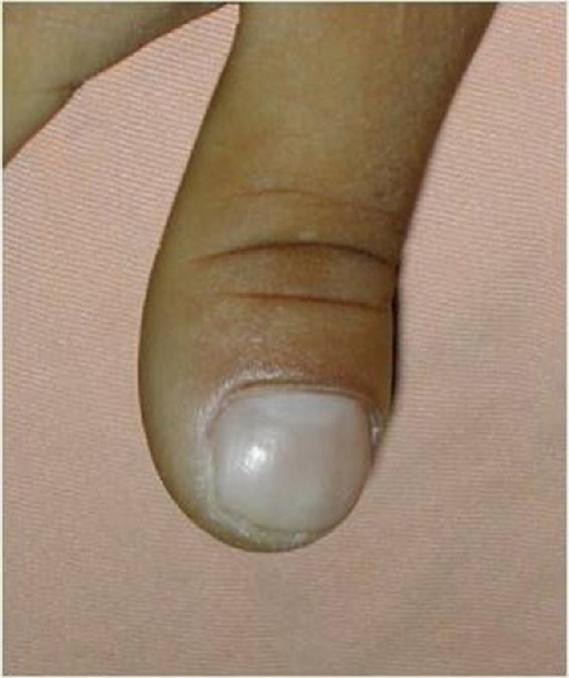 The clinical study objectified a swelling of the right thumb with deformation of the nail without associated skin lesions or inflammatory signs ([Figure 4a]). 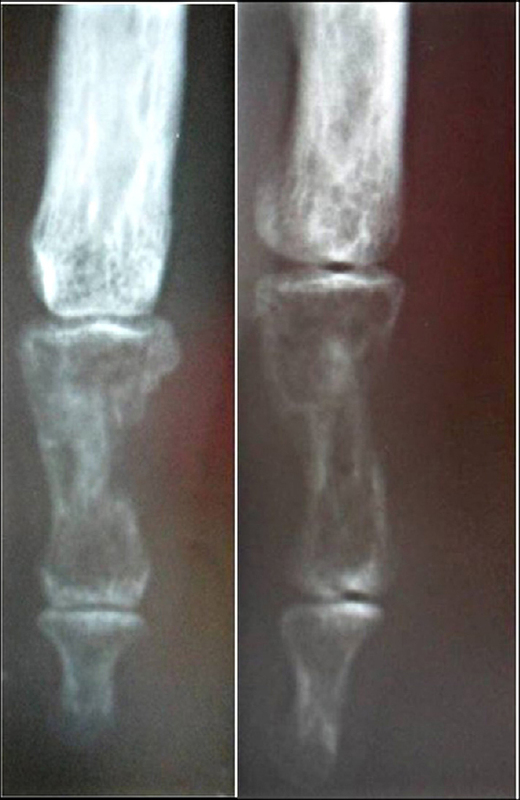 The radiography revealed an osteolytic lesion on the second phalanx of the thumb ([Figure 4b]). There was no narrowing of the interphalangeal joint. The analytical study showed elevated acute phase reactants (ESR = 80 mm). Surgical exploration noted a grayish geode. The bacteriological analysis was negative. The histological study showed bone tissue colonized by a granulomatous inflammation centered by caseous necrosis, confirming the diagnosis of tubercular dactylitis. There was no history of tuberculous contagion. The intradermal tuberculin reaction test was positive. Investigations did not reveal other tubercular sites. The patient received anti-tubercular chemotherapy with isoniazid, rifampicin, pyrazinamide and streptomycin for 2 months followed by isoniazid and rifampicin for 10 months. An immobilization of the thumb by a splint was initiated for 1 month. The treatment provided full recovery with good functional outcome and complete resolution of clinical and radiological signs. Figure 4a: X-ray showing a deformation of the nail with localized swelling. Figure 4b: X-ray showing an osteolytic lesion of the second phalanx of the thumb. The first case of tubercular dactylitis was reported by Leung . Ben Keddache  reported 45 cases of TB of the hand representing 7% of the 650 cases of musculoskeletal system TB. There were only 4 cases of tubercular dactylitis among the 45 cases of hand TB. 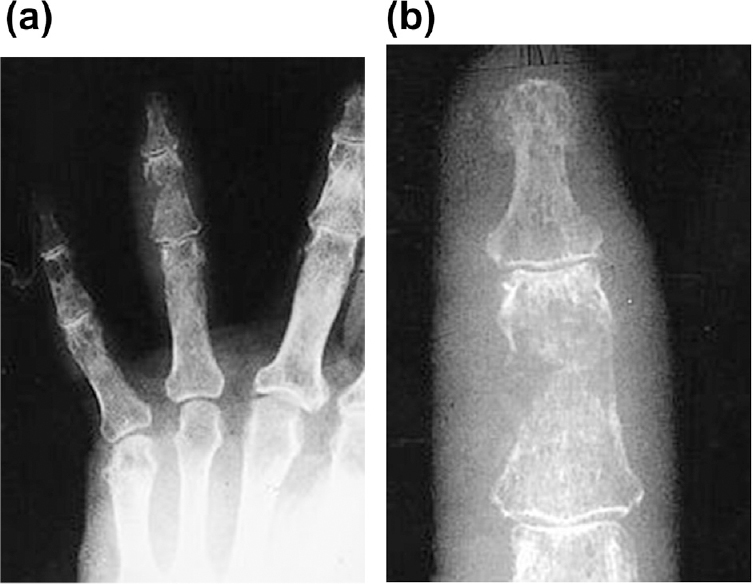 In most series, tubercular dactylitis represents 2–4% of osteoarticular TB . This rarity may be explained by the small size of hand bones. The course of the disease is insidious in the majority of the cases, which was noted in 3 of the 4 cases. Immunodeficiency was noted in three of the patients (diabetes, breast cancer and corticotherapy). Trauma is suggested to play a part in tuberculous reactivation . A history of trauma was noted in one of the patients. The exact mechanism of how MTB reaches the musculoskeletal system is not fully understood, although hematogenous dissemination after pulmonary involvement and direct inoculation are viable hypotheses . There is no evidence of concomitant active or sleeping tuberculous foci in any other location than the dactylitis in these cases. This is not an exception and it has been reported in other cases ,. The involvement of the proximal phalanx of the second and third fingers are the most frequently reported localizations of tuberculosis dactylitis ,,, contrary to the observations where the second phalanx of the fourth and fifth fingers have been involved. The rarity of the isolated osseous involvement of the phalanxes of the fingers would be due to the small size of the bones of the hand. The majority of the cases of TB dactylitis are originally a long time clinically tolerated osteitis that extended secondarily to the joint. This lesion is characterized by a radio-clinical discordance because of the long tolerance of the disease . The patient usually presents with a long-time progressive isolated tumefaction that causes little pain or completely painless, and is able to evolve to fistulization . Joint mobility usually remains preserved. On standard radiography, TB dactylitis can take on various aspects: at an early stage, radiological signs are little suggestive. It is usually a simple cortical demineralization giving the appearance of an osteoporosis. A geode or an articular pinching is more suggestive. The geodes are variable in size with or without osseous sequestrations. The vague aspect, gummed and sometimes nibbled of the phalanxes, as well as the interruption of cortical, are also evocative signs. The absence of periosteal reaction characterizes the tubercular osteitis . Histological study has the advantage of providing relatively fast results and the surgical biopsy is easily carried out, but exposes the patient to the risk of contamination and fistulization of the skin . The typical histological aspect is a granuloma with epithelioid and Langhans giant cells associated with caseous necrosis. The MTB can be histologically highlighted by the special coloring of Ziehl–Neelsen. The intradermal tuberculin reaction test is usually positive, but its negativity does not eliminate the diagnosis of TB . The differential diagnosis is essentially the primitive and secondary malignant tumors, although their localization in the hand remains exceptional. Chondroma, osteoid osteoma, synovitis, sarcoidosis, pyogenic osteomyelitis and other granulomatous infections may also be considered as differential diagnoses for TB dactylitis. Indeed, an isolated lucency with speckled calcifications can evoke a chondroma. A well-demarcated lytic lesion surrounded by a distinct zone of sclerosis can point to an osteoid osteoma. An articular swelling with multi-geodic images without periosteal reaction can evoke a synovitis . The diagnosis of certainty of active TB requires a bacteriological study identifying MTB on Ziehl–Neelsen staining showing acid-fast bacilli or after culture on the Löwenstein–Jensen medium. However, the bacilli are usually in small quantities and cannot always be identified. In addition, the result of the cultures is only known after 4–6 weeks. When bacteriological research proves to be negative or while waiting for the result of the cultures, the diagnosis of TB is based on a set of arguments: the clinical and radiological study, the intradermal tuberculin reaction test, the histological data, evoking the diagnosis and proposing a test treatment while waiting for the culture results. The treatment of TB dactylitis mainly consists of long-term anti-tubercular chemotherapy: isoniazid, rifampicin, pyrazinamide and streptomycin for 2 months, then isoniazid and rifampicin for 10–14 months, along with immobilization, which leads to a progressive eradication of the MTB, whereas the radiological lesions improve slowly. TB dactylitis represents a very particular lesion with different aspects according to the localization. The long tolerance of the disease leads to a radio-clinical discordance. TB should be suspected in cases of longstanding pain and swelling of a finger, especially in an endemic area. Efficiency of anti-tubercular treatment remains undisputed. The surgical indications are limited to the biopsy, usually essential to the diagnosis. Written informed consent was obtained from the patients for publication of these case reports and any accompanying images. Copies of the written consent forms are available for review if necessary. The study was approved by the institutional review board. E.P. Urovitz, Tuberculous dactylitis: a rare entity, Can. J. Surg. 25 (1982) 689–690. P.C. Leung, Tuberculosis of the hand, Hand 10 (1978) 285–291. Y. Ben Keddache, S.E. Sidhoum, A. Derridj, Les différents aspects des tuberculoses de la main, Á propos d'une sé rie de 45 cas, Ann. Chir. Main 7 (1998) 166–175. E. Ben Brahim, S. Abdelmoula, B. Ben Salah, F. Kilani, S. Chatti, Une tuberculose digitale révé lée par un traumatisme, Rev. Chir. Ortho. 89 (2003) 71–74. H. Masood, S.T. Yashwant, J. Atin, K. Rajender, Tubercular arthritis of the elbow joint following olecranon fracture fixation and the role of TGF-beta in its pathogenesis, Chin. J.Traumatol. 16 (5) (2013) 288–291. S. Batra, M. Ab Naell, C. Barwick, R. Kanvinde, Tuberculous pyomyositis of the thigh masquerading as malignancy with concomitant tuberculous flexor tenosynovitis and dactylitis of the hand, Singapore Med. J. 48 (11) (2007 Nov) 1042–1046. D.C. Yao, D.J. Sartoris, Musculoskeletal tuberculosis, Radiol. Clin. North Am. 33 (1995) 679–689. P.P. Kotwal, S.A. Khan, Tuberculosis of the hand. Clinical presentation and functional outcome in 32 patients, J. Bone Joint Surg. Br. 91-B (2009) 1054–1057. R.C. Venkata, K. Sunil, B. Rajendra Pal Singh, Tuberculosis of short tubular bones: a rare presentation, J. Evol. Med. Dent. Sci. 3 (2014) 4468–4472. N. Haider, M. Aziz, A.Q. Khan, M. Zulfi Qar, Tubercular dactylitis and multifocal osteoarticular tuberculosis – two rare cases of extrapulmonary tuberculosis, BMJ Case Rep. (2011), http://dx.doi.org/10.1136/bcr.09.2011.4800. N. Ritz, T.G. Connell, M. Tebruegge, B.R. Johnstone, N. Curtis, Tuberculous dactylitis: an easily missed diagnosis, Eur. J. Clin. Microbiol. Infect. Dis. 30 (2011) 1303–1310. R. Bandyopadhyay, A. Mukherjee, R.K. Mondal, Case report: “Spina Ventosa” tuberculous dactylitis in a 2 year old boy – a very rare disease, Open Orthop. J. 6 (2012) 118–120. G.A. Versfeld, A. Solomon, A diagnostic approach to tuberculosis of bones and joints, J. Bone Joint Surg. Br. 64 (1982) 446–449.